A recent Sunday lunch in Kennington turned out to be a pleasant surprise. The Black Prince in Kennington has been one of those places that I have driven past for years and never ventured into. The Black Prince is a modest pub with bags of character standing on the end of Black Prince road near the junction of Kennington cross. 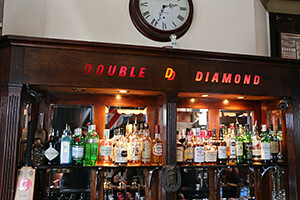 The first thing I notice when we enter the pub is the old Double Diamond sign at the top of the bar, its carved into the wooden bar and backlit with red lights. Its very reminiscent of the 1970s’ when the Double Diamond Works Wonders advert was constantly played on our Tv’s. This pub definitely works wonders when it comes to customer service and attention to detail and landlord Mark Allan was working wonders on the floor, where he was in full control and looking like he was enjoying himself. A good Sunday lunch in the Pub is one of the hardest things to find in London and you could do no better than the Prince. I was very impressed with the pub and a few days later I caught up with Mark for a chat about his experience in the pub business. He has been in the business most for all of his life since he left school and has worked in numerous positions from pot washer, bar man, busboy to Dj to eventually running his own club in Canada. He first stated at the age of 14 working in a cafeteria in Alders department store in Chatham at the weekends to make some pocket money. Mark is 50 years old and so his experience goes back to the late 1970’s when the pub industry was very different to how it is today. When Mark arrived at the Prince some five years ago very little had been changed and the pub was in a poor state of repair. This turned to his advantage, as buried beneath many layers of wood-panels, paint and carpet were some lovely original features which give the pub its homely charm.